Athletes of all kinds experience injury at one point in their career. Whether you’re a weekend warrior, a spontaneous jogger on a warm summer evening or a dedicated athlete, niggles and on-going pain have the ability to dampen your athletic activities. There is a number of factors which will contribute to an injury of the lower limb; terrain, distance, previous injury, over/under training, diet and proximal strength all have a part to play in why a person may suffer an injury, but today our focus will be on foot strike pattern and the most common pathological breakdowns associated with the gait in question. Foot Strike patterns in runners vary astronomically, basically if the plantar surface of the foot is viewed as a continuum any given athlete may strike on any one part of the continuum and this also has the prosperity of changing depending on other intrinsic and extrinsic influences at the time. For the sake of simplicity, this article will look at the three most recognized foot strike patterns during running; Rearfoot, Mid-Foot and Forefoot. The rearfoot heel strike during running as a general rule will pursue the following anatomical moments from ground contact through to toe off; The lateral heel is the first point to make contact with the ground creating a breaking moment while the foot sits in a dorsiflexed position, the foot then pronates upon the longitudinal axis of the foot taking the foot into a plantarflexed position as the mid-foot makes contact with the ground. At this point continued rotation of the tibia has the potential affect more proximal structures if happening at an excessive or exceedingly fast rate. The knee then begins to move over the foot to place the ankle joint into dorsiflexion again, continuing the moment of forward momentum velocity. As the body moves over the forefoot, the foot begins to re-supinate into toe off and propulsion leading the foot once again into dorsiflexion for the purpose of ground clearance (Dugan & Krishna P. Bhat, 2005). The rearfoot strike during running has been viewed as the most commonly practiced by those who participate in sub-maximal events of all levels (Larson, et al., 2011). Although rearfoot strike is a notable extension of the gait used in non-pathological walking we stop short of declaring it the ‘natural’ way of running due to extrinsic influences on this particular gait pattern such as increased cushioning on the heel of modern athletic footwear and the foot being placed in dorsiflexion as a result of increased heel height and forefoot upward bend (Novacheck, 1997). Navicular Stress Reactions, Tibialis Posterior Injury, Medial Tibial Stress Syndrome, Patella-Femoral Syndrome and Hip Pain (Brukner & Khan, 2007). 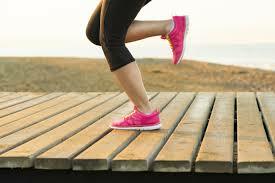 The mid-foot strike pattern commonly begins with a dorsiflexion of the ankle as the body aims to fall forward. With the knee flexed the foot is placed down making initial contact with the mid-foot and continues with forward momentum onto the forefoot, supinating and leading to propulsion. There is less breaking and rotational force associated with the mid-foot strike however, there can be increased vertical forces due to the premise of Newton’s Third Law but this is not to say that this is a disadvantage of mid-foot gait as larger muscle groups more proximal to the foot are able transfer these forces via the triple extension motion of the hips, knee and ankles (Michaud, 2011). Mid-foot strike became popular in 1999 with the introduction of Chi Running. The philosophy like many of the Chinese based techniques looks to align and relax the body for the purpose of body flow, better efficiency and reduced injury risk. Chi running has a forward lean which encourage gravity to become the driving force behind the runner’s forward momentum in addition to core strength for propulsion. I won’t comment on the evidence for Chi Running specifically, that may be for another day, today’s focus is purely that of a mid-foot strike. Injuries which can possibly be associated with repetitive mid-foot strike increased vertical forces and poor landing mechanics include; Metatarsal Stress Reactions, Navicular Stress Reaction, Anterior Shin Pain, Patella Injury, ITB Syndrome and Hip Flexor Pain (Brukner & Khan, 2007). Forefoot striking has very recently been advocated as the running technique which produces the least amount of injuries but was also unfortunately tied to the popular fad of barefoot running; even though as a technique it has been around for quite some time. Dr. Nicholas Romanov was one of the first to promote the use of forefoot running with the introduction of his Pose Technique within the Soviet Union in the 1970’s. The Pose Technique encouraged a forefoot strike with a forward lean to use the influence of gravity as a momentive force and muscle contraction as a secondary force. The body is held in an S-like position with a forward ankle lean, knees bent and the feet pulling up under the hips not the buttocks – the ball of the foot lands under the Centre of Mass. The technique was designed for performance of Olympic athletes (ARENDSE, 2004). The general movement pattern for forefoot striking begins with the placement of the foot in a plantarflexed position to the ground making contact with the MTPJs. At this point the heel then drops toward the ground and the knee comes over the toes creating a moment of dorsiflexion and increasing stretch tension within the achillies tendon. The body continues to fall forward placing the foot behind the Centre of Mass and allowing for propulsion through triple extension of the posterior muscles pushing the subject forward. Forefoot striking can reduce impact force on ground contact and decrease the amount of rotation of the lower limb however; it also increases the demand on the small bones and soft tissue components of the lower leg. Injuries which can possibly be associated with repetitive rearfoot strike include; Nail Trauma, Metatarsal Stress Injury, Neuroma, Peroneus Brevis Injury, Lateral Ligament Injury and Achillies Overuse. 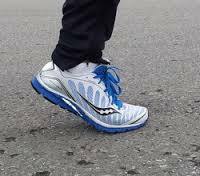 Each foot strike during running has its advantages and disadvantages and the truth is most people with find a technique naturally which is of the most efficiency to them and reduces the risks associated with that particular strike pattern. Both extrinsic and intrinsic factors have a considerable influence on a person’s injury and quite commonly it cannot be diagnosed as one particular contributor. Previous injury, over-training, under-training, poor conditioning, poor proximal strength, footwear cushioning, terrain, distance and stride length are just a few factors which can provide impact on susceptible runners. In my opinion, for the most part – no, there are many other options available to practitioners to utilise outside of gait retraining, in particular for injury purposes. The purpose of Performance however is another issue which will be dealt with later this month. Strengthening and Conditioning, footwear change, orthotic devices, terrain change and even distance change can be possible interventions. If a patient is continually becoming injured there is a lot more to the situation than their foot strike position and in many cases foot strike may change over time as a result of fatigue or surface change.